The Middle East could become a land bereft of Christians, Pope Francis warned at an ecumenical prayer meeting yesterday. The Pope was speaking at a retreat in Bari on the southern Adriatic coast of Italy, where the relics of St Nicholas – venerated by both Catholics and Orthodox Christians – are held. The port town has geopolitical significance, as Bari has long been a crucial link between east and west. The heads and representatives of 19 different Christian churches were present, all of whom are deeply concerned about the fate of Christian populations in the Middle East. The countries where numbers are falling the most are Syria, where more than 600,000 Christians have fled; Iraq, where the Christian population is now one-third the size it was five years ago; and Egypt, where more than 200,000 Coptic Christians have left the country in the face of sectarian persecution, some of which appears to be state-sponsored. In Israel, Christians make up about 2 per cent of the population, a proportion that has remained relatively steady since the state was founded; but in the besieged Palestinian territories the number of Christians has fallen dramatically. In the West Bank in the 1970s, Christians made up 5 per cent of the population – now they make up only 2 per cent. Gaza was once home to 5,000 Christians, but now there are barely 1,000. Most worryingly, there is talk that the birthplace of Christianity, Bethlehem, may one day be without Christian residents. In the 1950s, Christians made up 86 per cent of the population in Bethlehem and nearby Beit Sahour and Beit Jala, but Christians today now account for only 12 per cent of the population in these towns. 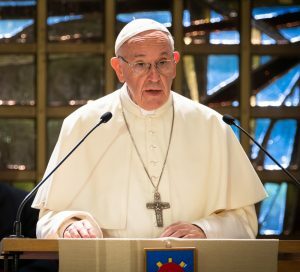 In his address, the Pope said the Middle East was a region “so full of light”, but recently it had been covered by “dark clouds of war, violence and destruction, instances of occupation and varieties of fundamentalism, forced migration and neglect”. Not only have Christians fled the region, the Middle East is peopled with refugees, particularly those escaping war in Syria and Lebanon, Palestinians fleeing persecution by Israel and Israelis fleeing persecution of Jews in Europe. “The Middle East has become a land of people who have left their own lands behind,” said Pope Francis. In this chaos, there is now a growing likelihood that the presence of Christians in the region will be totally diminished, said the Pontiff.